The good news is that the Toyota Corolla is one of the highest quality, most affordable compact cars on the market today; but, the great news is that it’s for sale near Indianapolis at Andy Mohr Toyota. Sweet! If you’re interested in either buying or leasing this vehicle, then we encourage you to keep reading this guide. Otherwise, get in touch with us with your questions, or to schedule your exclusive test drive. There are different benefits to either buying or leasing the Toyota Corolla, all depending on your needs. Buying. When you buy, you’re investing in an asset that you could someday sell if you needed to. Plus, you’re free to make as many customizations as you’d like, and to drive for as long or as far as you want. Leasing. When you lease, you’re choosing the excitement of knowing that you’ll trade in your current Toyota Corolla for a thrilling future model as soon as your lease is up. Plus, service is often included. Regardless of whether you’d prefer to buy or lease, you can do it today at our Indianapolis area dealership. Here’s a brief look at some of the main features for each 2019 Toyota Corolla trim level. Check ‘em out! Toyota Corolla L: Toyota Safety Sense™ P (TSS-P), Eight Airbags, Bluetooth® Connectivity, USB Port, etc. Toyota Corolla LE: Entune™ Audio with 6.1-Inch Touchscreen Display, Integrated Backup Camera, etc. Toyota Corolla LE Eco: Estimated 30 Miles per Gallon in the City & 40 Miles per Gallon on the Highway1 Toyota Corolla XLE: Multi-LED Headlights with LED Accent Lights, Smart Key System, and much more… Toyota Corolla SE: Gloss-Black/Mesh-Patterned Grille, Rear Spoiler, 17-Inch Machined Alloy Wheels… Toyota Corolla XSE: Power Tilt/Slide Moonroof with Sliding Sunshade, SofTex®-Trimmed Front Seats However, be sure to get in touch with us to see exactly what we have in stock at any given moment, ok? So…why us? Because no other Indiana Toyota dealerships give you the same quality of selection or the same reliability of support as Andy Mohr Toyota. When you shop for your Corolla at our Indianapolis area location, you’ll find that we carry a wide range of potential trim levels: from the L and the LE to the LE Eco and the XLE to the SE and the XSE. Additionally, we have pre-owned and CPO options on hand. Then, when it comes to financing, service, parts, and all the other supportive measures that you need to ensure that your driving life goes as smoothly as you’d like it to…yeah, we cover all of that stuff, as well. Contact us to set up your exclusive Toyota Corolla test drive near Indianapolis! All it requires is a call, a text, an instant message, or a quick visit, and you could be experiencing Toyota’s 2018 Corolla for yourself. That’s how convenient things can be when it’s for sale at Andy Mohr Toyota. 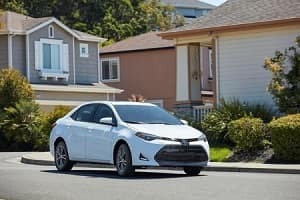 12019 EPA-estimated 30 city/40 highway/34 combined mpg for Corolla LE Eco. Actual mileage will vary.